The final five horses to arrive at Keeneland on Thursday for Saturday’s $1 million Toyota Blue Grass (G1) got acquainted with the main track on a brisk Friday morning. Three of the runners – Goats Town, Lookin for a Kiss and Zapperini – arrived from Churchill Downs; Twizz came from the Trackside Training Center in Louisville; and Cards of Stone came from Belmont Park. The Toyota Blue Grass, in addition to its Grade 1 status and $1 million purse, carries 170 points toward the Kentucky Derby on a scale of 100-40-20-10 to the first- through fourth-place finishers. Post time Saturday is 6 p.m. ET. Post 1 – Lookin for a Kiss: Michael Bruder’s Lookin for a Kiss galloped after the renovation break with exercise rider Augustine Hernandez aboard. Recently transferred to the barn of trainer Mike Tomlinson, Lookin for a Kiss has won one of two starts and will be riddenSaturday by Tyler Gaffalione. Gaffalione, who never has ridden at Keeneland, was aboard for the maiden victory. By Lookin At Lucky, Lookin for a Kiss has no Kentucky Derby qualifying points. Post 2 – Donegal Moon; Post 4 – Zulu; Post 11 – Cards of Stone: Trainer Todd Pletcher’s three entrants in the Toyota Blue Grass all galloped 1¼ miles before the morning renovation break, assistant Tristan Barry said. The move was the first at Keeneland for Cards of Stone, who arrived Thursday morning from New York. Barry hasn’t spent much time with Highclere America, McConnell Racing Stable, Wachtel Stable and Darlene Bilinski’s Cards of Stone but has watched the Bustin Stones gelding’s races on TV. “He seems like he’s a free-running horse who likes to be left alone and use his weapon, which is his speed,” he said. Zulu has 20 Derby qualifying points. Donegal Moon and Cards of Stone have no Derby qualifying points. Post 3 – Cherry Wine/Post 6 – Brody’s Cause: Trainer Dale Romans sent his two Toyota Blue Grass hopefuls to the track for routine gallops under exercise rider Miguel Garcia after the renovation break. “Everything is good here,” said Romans, who would like to see a dead heat at the wire with his two stretch runners. A dead heat to win would notch each runner 70 points toward the Kentucky Derby. “Seventy, that should be enough,” Romans said of the Run for the Roses that is limited to the top 20 point earners that pass the entry box. Entering Saturday’s race, Brody’s Cause, by Giant’s Causeway, has 14 Derby qualifying points and Cherry Wine, by Paddy O’Prado, five. Both horses were scheduled to school in the Paddock in Friday’s first race. Post 5 – Crescent Drive: Paul Van Doren’s Crescent Drive, who will be making his graded stakes debut Saturday, galloped before the renovation break under exercise rider Juan Gonzalez. Trained by Tom Amoss, the Flower Alley colt has no Derby qualifying points. Post 7 – Laoban: Trained by Eric Guillot, the Uncle Mo colt jogged two miles early and was scheduled to school in the Paddock with Friday’s 3rd race. Arriving at Keeneland around 9 a.m. after a red-eye flight from Los Angeles to Cincinnati/ Northern Kentucky International Airport were Laoban’s co-owners, Mark and Jennifer McCormick of McCormick Racing. The McCormicks have been involved in Thoroughbred ownership only since the end of 2014 but Mark always has always been interested in horses and racing. He grew up riding pleasure horses on his family’s farm in Vincennes, Ind., and thinking it would be fun one day to have racehorses and his own farm. After graduating from Indiana University with majors in English and music, Mark, talented with the guitar, moved to California to pursue a career in the music business. There he met his wife, Jennifer Xiao Rong McCormick, who had moved to the U.S. from China in 1997. The couple married in 2000. Mark named Laoban, which means “boss” in Mandarin Chinese and is pronounced “Lay-ban.” The McCormicks own 25 percent of the colt while Southern Equine Stable owns 75 percent. Laoban, a maiden, has 22 Kentucky Derby qualifying points. Post 8 – Twizz: Warner Thoroughbreds, Freddy and Jessica Lewis III, Brett and Jim Setzer and Justice Racing Stable’s Twizz galloped shortly after 6 a.m. with exercise rider Orlando Aguilar aboard for trainer Mike Maker. By Twirling Candy, Twizz has no Kentucky Derby qualifying points. Post 9 – Goats Town: Calumet Farm’s Goats Town walked through the Paddock after the renovation break under exercise rider Allison Walker and then galloped a mile and quarter. “He’s a good feeling dude,” Walker said of the Dublin colt, a maiden who has no Kentucky Derby qualifying points. Two-time Toyota Blue Grass winner D. Wayne Lukas trains Goats Town. Post 10 – American Dubai: Richard Keith’s American Dubai galloped after the renovation break with exercise rider Jerry O’Dwyer aboard. Chris Landeros, who rode American Dubai in his most recent start in the Rebel (G2) will again partner with the Rodney Richards trainee. “I just hope he gets a clean break and is able to get a good position,” Richards said of his first Toyota Blue Grass starter. By E Dubai, American Dubai has two Derby qualifying points. Post 12 – Zapperini: Lloyd Madison Farms IV’s Zapperini, fifth in the Risen Star (G2) in his most recent start, walked through the Paddock after the renovation break and then jogged under exercise rider Margarito Fierro. Trained by Greg Foley, the Ghostzapper colt has no Derby qualifying points. Post 13 – Star Hill: Calumet Farm’s Star Hill galloped before the renovation break with exercise rider Jennifer Patterson aboard. Star Hill, by Elusive Quality, is trained by Rusty Arnold, who has won five Grade 1 races at Keeneland but never the Toyota Blue Grass. Star Hill has 10 Derby qualifying points, accumulated with a third-place finish in the Tampa Bay Derby (G2) in his most recent start. Earlier Saturday, Arnold will try to double his Central Bank Ashland win total when he sends out Weep No More against thelikes of Cathryn Sophia, Carina Mia and Rachel’s Valentina. Post 14 – My Man Sam: Sheep Pond Partners, Newport Stables and Jay W. Bligh’s My Man Sam galloped about 1½ miles after the renovation break. Bligh, who lives in Del Mar, Calif., bred My Man Sam, who was born at historic Claiborne Farm in Paris, Ky. The colt’s dam, Lauren Byrd, by Arch, was second in Keeneland’s 2010 JPMorgan Chase Jessamine. By Trappe Shot, My Man Sam has no Derby qualifying points. 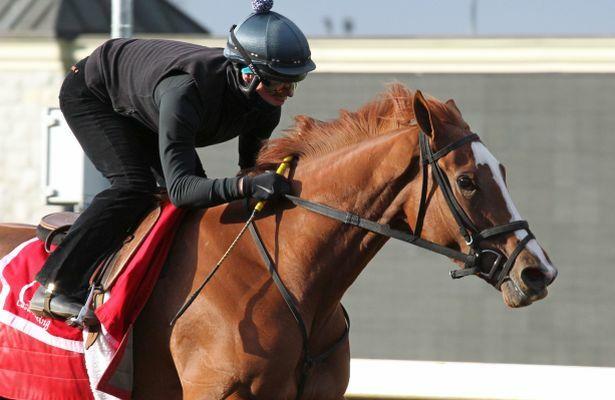 For more about the horses in the Toyota Blue Grass and their connections, click here. Reddam Racing’s Nyquist, the undefeated favorite for the Kentucky Derby Presented by Yum! Brands (G1), walked the shedrow at his Keeneland barn Friday morning. Winner of last Saturday’s Xpressbet.com Florida Derby (G1), Nyquist was scheduled to return to the track Thursday but a slightly elevated white blood cell count kept the colt in the barn. Sisterson said Nyquist is scheduled to go to the track in the morning. $125,000 APPALACHIAN (G3) PRESENTED BY JAPAN RACING ASSOCIATION (entries taken Sunday, raceThursday) – Baciami Piccola (GB), Catch a Glimpse, Felt in Pocket, Outsider Art, Recognition. $300,000 MAKER’S 46 MILE (G1) (entries taken Tuesday, race Friday, April 15) – Conquest Typhoon, Dac, Heart to Heart, Reload, Shining Copper, Tourist. $350,000 COOLMORE JENNY WILEY (G1) (entries taken Wednesday; race Saturday, April 16) – Akatea (IRE), Dacita (CHI), Illuminant, Tepin, Wekeela (FR). $200,000 BEN ALI (G3) (entries taken Wednesday; race Saturday, April 16) – Ami’s Holiday, Breaking Lucky, Eagle, General a Rod, Neck ‘n Neck. $150,000 LEXINGTON (G3) (entries taken Wednesday; race Saturday, April 16) – Big Squeeze, Direct Message, Lomcevak, Pinson, Riker, Synchrony, Yo Carm. $100,000 GIANT’S CAUSEWAY (entries taken Wednesday; race Saturday, April 16) – Eden Prairie, Exaggerated, Jewel of a Cat, Lindisfarne, Maggiesfreuddnslip, Miss Ella, Miss Matzoball, Rapid Rhythm, Sweet Success. $150,000 ADENA SPRINGS BEAUMONT (G3) (entries taken Thursday, April 14; race Sunday, April 17) – Cosmic Girl, Kinsley Kisses, Lightstream, Nickname, Northwest Tale, R Girls a Charmer. Three candidates for Thursday’s 28th running of the $125,000 Appalachian Presented by Japan Racing Association (G3) at a mile on the turf worked on the main track after the Friday morning renovation break. Catch a Glimpse, winner of all four of her grass starts including a victory here last fall in the Breeders’ Cup Juvenile Fillies Turf (G1), worked a half-mile in :49.40. Keeneland clockers got her first quarter-mile in :24.40 and out five furlongs in 1:03.20. Mark Casse trains Catch a Glimpse. Florida Oaks (G3) winner Baciami Piccola (GB) worked a half-mile in company in :47.60 with jockey Julien Leparoux aboard. Baciami Piccola started two lengths in back of her workmate and surged past at the wire, galloping out five furlongs in 1:01. Brian Lynch trains Baciami Piccola. Ava’s Kitten, who finished fifth as the favorite in the Florida Oaks, worked a half-mile in company in :49.60. Trained by Chad Brown, Ava’s Kitten was clocked in :24.80 for the first quarter of a mile and galloped out five furlongs in 1:03. Prior to Baciami Piccola’s work, Lynch sent out Maker’s 46 Mile (G1) probable Heart to Heart. With Leparoux aboard, Heart to Heart worked a half-mile in :48.80 with an opening quarter in :23.80 and five-eighths gallop-out in 1:02.40. Trainer Todd Pletcher worked a couple of horses for upcoming Keeneland stakes. General a Rod, being pointed to the $200,000 Ben Ali (G3) next Saturday, worked a half-mile in :48.40 with an opening quarter in :24 and and a gallop-out in 1:02. Two-time Grade 1 winner Curalina, unraced since a third-place finish in last fall’s Breeders’ Cup Distaff (G1) here, worked five furlongs in 1:00.40. Curalina was timed in :36 for her first three-eighths and galloped out six furlongs in 1:14 in preparation for the $100,000 Hilliard Lyons Doubledogdare (G3) on April 22. The passing Wednesday night of Ogden Mills “Dinny” Phipps, a prominent American financier, Thoroughbred breeder and owner and former longtime chairman of The Jockey Club, served as a reminder of his family’s historic connection to the Thoroughbred industry and to Keeneland. Phipps’s father, Ogden Phipps, raced four stakes winners here: Numbered Account, winner of the 1972 Spinster; Fast Play (1988 Breeders’ Futurity-G2), My Flag (1996 Ashland-G1) and Cat Cay (2001 Thoroughbred Club of America-G3). In the name of Phipps Stable et al, Ogden Mills Phipps won eight stakes: Inside Information (1994 Ashland-G1 and 1995 Spinster-G1), Dispute (1994 Spinster-G1), Good Reward (2004 Storm Cat), Dancing Forever (2008 Fifth Third Elkhorn-G2), Parading (2009 Ben Ali-G3), Point of Entry (2012 Elkhorn-G2) and Mr Speaker (2014 Coolmore Lexington-G3). Of these Keeneland stakes winners, Lexington native C.R. “Shug” McGaughey III trained all but one. In today’s $100,000 Transylvania (G3) Presented by Keeneland Select, Stuart Janney III and Phipps Stable will send out Inspector Lynley, trained by McGaughey. Janney is Ogden Mills Phipps’ cousin. Together, they won the 2013 Kentucky Derby Presented by Yum! Brands (G1) with Orb. Ogden Mills Phipps’ survivors include his daughter Daisy Phipps Pulito, a Keeneland Director. This is the sixth year Central Bank has sponsored the $500,000 Ashland (G1), which on Saturday is being run for the 79th time. Making the trophy presentation to the winning connections of the prestigious race for 3-year-old fillies will be Central Bank Chairman, President and CEO Luther Deaton – a longtime Keeneland fan. Q: When was your first trip to Keeneland and what do you remember? Q: How would you describe a day at the races at Keeneland? A: “A day at Keeneland is a unique opportunity to combine the thrill of watching the world’s top Thoroughbreds compete at America’s most scenic racing venue. Whether you are a seasoned racing veteran or a newcomer to the sport, your day will be filled with beautiful sights, fabulous food (especially bread pudding) and heart-pounding excitement. Q: What does Central Bank’s partnership with Keeneland mean? A: “Together, Keeneland and Central Bank represent two of Central Kentucky’s most iconic brands. Both are known for their high standards and outstanding service. Central Bank’s partnership with Keeneland began in 2005 with the Transylvania Stakes. The bank received an overwhelming response that eventually led to its move up to the Ashland Stakes in 2010. The Ashland serves as the premier Grade 1 race for fillies at Keeneland’s Spring Meet. The race is the cornerstone of the bank’s spring sponsorship activities for it offers a unique opportunity to involve customers with racing’s most engaging venue. Fans seeking a behind-the-scenes view of Keeneland’s Spring Meet are invited to follow @keenelandracing on Periscope for all their insider videos, including graded stakes coverage, interviews with trainers and jockeys, and handicapping tips from our experts. Visit Keeneland.com for an upcoming schedule of Periscope broadcasts and video replays. College Scholarship Day. Thousands of students from colleges and universities in Kentucky and beyond will be at the track for this popular event. Keeneland partners with the Kentucky Thoroughbred Association to host the day. Admission is free with a college ID. Full-time students can register in the North Terrace to win one of ten $1,000 scholarships and prizes from local vendors awarded after each of the day’s races. Also to be given away following the post parade for the 8th race is the Runhappy Scholarship worth $10,000. The first 2,000 students to register will receive a Keeneland College Scholarship Day T-shirt courtesy of Kennedy’s Wildcat Den or a Southern Proper hat. Keeneland Shop’s Milliners Corner presents Christine A. Moore Millinery adjacent to the Walking Ring from 9 a.m. to the last race. Milliners Corner will feature hat makers from across the country. Tailgating on The Hill. Keeneland’s hugely popular tailgate lot, The Hill, located adjacent to the Keene Barn & Entertainment Center, will feature local food trucks, a jumbo television screen, wireless wagering and wagering terminals, race-day programs, a Keeneland Shop kiosk and free shuttles to the track. Friday Pick 4 Presented by TVG. A $200,000-guaranteed pool will be offered on the final four races of the day. Sunrise Trackside. Itching to experience the sights and sounds of Keeneland in the morning? Sunrise Trackside, sponsored by LEX18 and Dunkin’ Donuts, offers activities for all ages beginning at 7 a.m. Fans can enjoy Breakfast With the Works, a Southern-style breakfast and trackside commentary while horses train on the main track (until 8:30 a.m.); children’s activities in the Kids Club Corner (7-9 a.m.); Keeneland tours (8-10:30 a.m.); Paddock demonstration with the Lexington Mounted Police Unit (9 a.m.); a trackside handicapping seminar (11 a.m.); and a Q&A session with jockey Javier Castellano in the Paddock (11:35 a.m.). Keeneland Shop’s Milliners Corner presents Christine A. Moore Millinery adjacent to the Walking Ring from 9 a.m. to the last race. Craft Beer Tent. The special selection of beers will include Blue Stallion, Country Boy, Fat Tire, Kentucky Ale Race Day IPA, Land Shark, Shock Top, Sierra Nevada and Woodchuck Hard Cider. Tailgating on The Hill. Keeneland’s hugely popular tailgate lot, The Hill, located adjacent to the Keene Barn & Entertainment Center, will feature local food trucks, a jumbo television screen, wireless wagering and wagering terminals, race-day programs, a Keeneland Shop kiosk and free shuttles to the track. The Hill will showcase Central Kentucky’s favorite bluegrass bands from 12-4 p.m. BETologists also will be available to answer fans’ questions. Big Apple/Bluegrass Pick 4 Wager. Keeneland and the New York Racing Association have created the special Big Apple/Bluegrass Pick 4 wager that begins with the Bay Shore (G3) (4:52 p.m. ET), followed by the Madison (G1) (5:20 p.m.), Wood Memorial (G1) (5:30 p.m.) and Toyota Blue Grass (6 p.m.). All-Stakes Pick 4 Presented by TVG. A $300,000-guaranteed Pick 4 featuring races 7-10, the Commonwealth (G3), Shakertown (G2), Madison and Toyota Blue Grass. All-Stakes Pick 5 Presented by TVG. A $300,000-guaranteed Pick 5 featuring races 6-10, Central Bank Ashland (G1), Commonwealth, Shakertown, Madison and Toyota Blue Grass. Jockey Autograph Signing. Fans may get autographs of active jockeys from 11:30 a.m. to 12:30 p.m. adjacent to the Paddock to benefit the Permanently Disabled Jockeys Fund.